I love Twitter. On Thursday night post-movie, we were struggling to find somewhere to grab a bite to eat and I quickly posted as much as we wandered around. 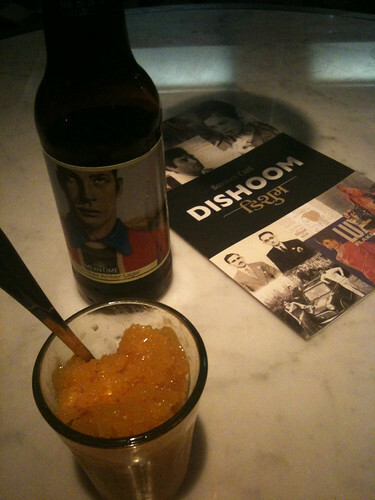 Immediately a response from @dishoomLondon popped up: “Come on over, we can squeeze you in!”. I don’t know if they connected work-me with Twitter-me but I’ve been aware of this Bombay Cafe’s imminent launch for some time as I did some work with them a few months back. It’s like when a good friend is pregnant and you’re anxiously waiting to see if all of the fingers and toes are intact and if they call it Moon Unit. There was an exceptionally clear vision behind this concept – would they pull it off? When we walked in, I saw architect’s drawings come to life in front of me. 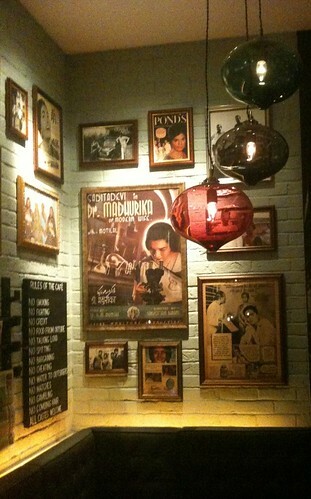 Dishoom‘s walls are lined with framed photographs and original ads from Bombay newspapers. Twisted black electrical cables loop from the light fittings across the room like long ropes of liquorice, between authentically wobbly ceiling fans. On each marble-topped table sits a plate stand to stack up main course plates, and a canteen of sparkling cutlery for you to help yourself. Dishoom is modelled on Bombay institutions such as the Britannia Cafe and Leopold’s, some of the last outposts of an Iranian cafe culture that has all but disappeared. The detailing in the main dining room, from the glowing filament light bulbs through to the almost Escher-worthy tiling is perfect, the overall atmosphere calming and elegant during our evening visit but with a decided air of bustle coming from the open kitchen and sidealong bar. We watched as the barman made two deep pink Bollybellinis for us (rose, lychee and raspberry). Yeah yeah, you say. But what about the food? 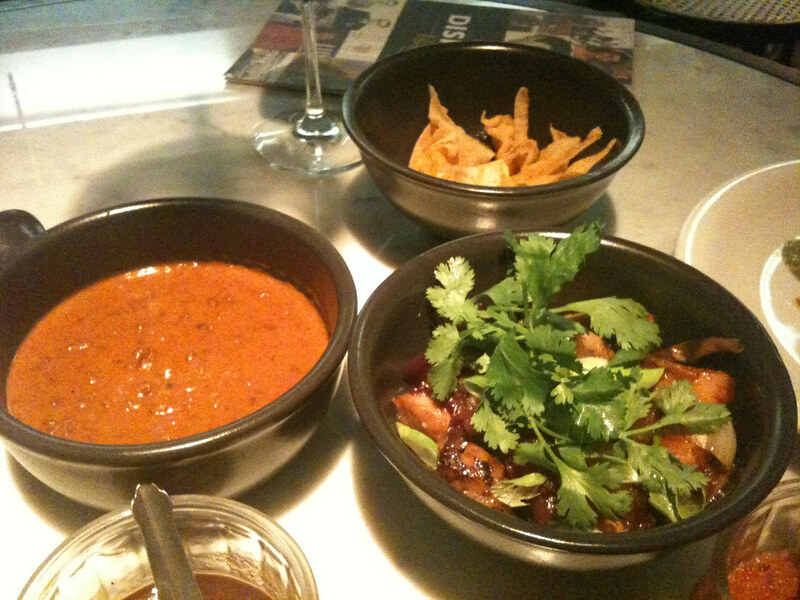 Cafe Crisps with their traffic light system of dips, (I really liked the tamarind, the amber of the trio) and Dishoom Calamari to start. 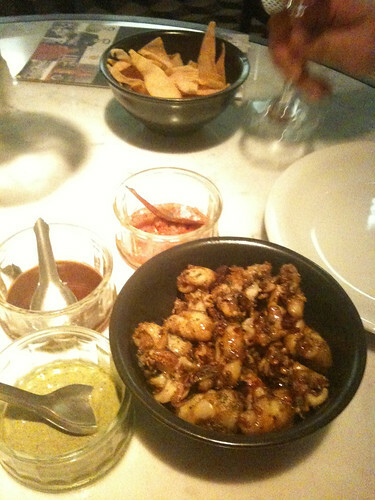 Some of the best, most succulent baby morsels of fresh squiddy goodness I’ve ever had the pleasure of experiencing. The marinade is spiced and sweet, almost honey-like. Next up, Bombay Sausages, with shiny caramelised red onions, along with the excellent House Black Daal and the freshest roomali roti and garlic naan. Nom. I could easily see myself heading here for lunch on colder days for just sausages and daal. No, I wouldn’t share the daal, you’ll have to get your own. Murgh Malai is an unusual cut of chicken with some fat, which is chargrilled and crisped (don’t expect solid cubes of breast) and the Biryani above was moist, spicy and had meat that fell apart throughout it. To finish we polished off a Meantime Union – not only does its malty treacle notes hold up well to the meaty carb dishes (it was chosen in a blind trial) but the Grant Wood-esque label works too – and shared a passionfruit and ginger Gola Ice. If they do those for takeaway and this weather holds, they could not only clean up on the Indian food market this summer but could beat the hell out of all the local frozen yoghurt places for the perfect cool-down snack. 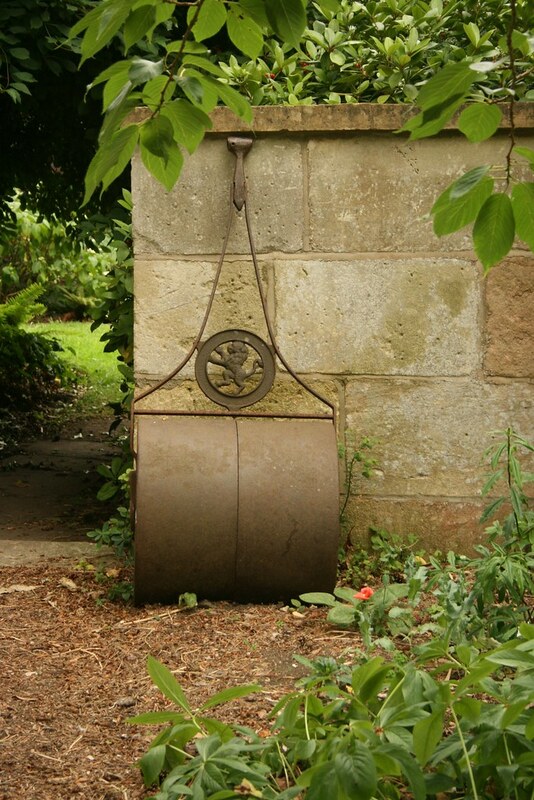 Young staff are enthusiastic and friendly. There’s details to admire everywhere, from the cabinets of authentic toiletries in the bathrooms to the house rules on the wall. I can imagine coming here for breakfasts or meetings, sitting in the banquets along the wall (wifi on from today, apparently) and downstairs boasts more tables, a full bar and deep leather-bench booths. 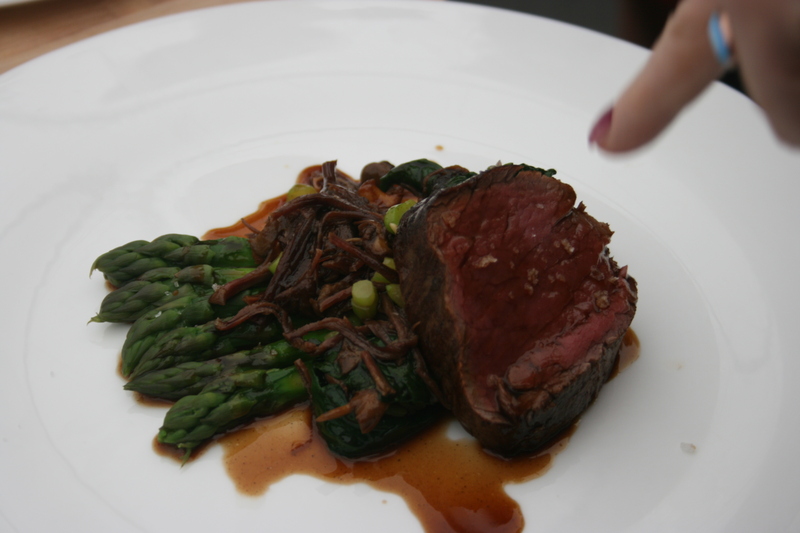 Service, food and atmosphere were great, and this was during soft launch. They’re fully open from next week. ‘Dishoom’ is the Bollywood equivalent of ‘Pow!’ or ‘Boom!’ and is also a quality, or self-confidence. Does their food have that ‘dishoom’? Given what we’ve seen so far, I’d say yes. I know I’ll go back. And if they continue as they’ve started, it’s capable of becoming a London institution. Phew. 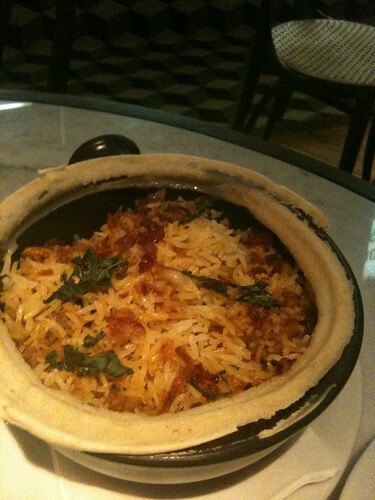 Dishoom has got all its fingers and toes.